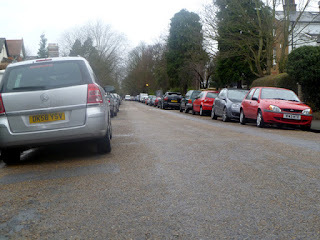 A SURVEY conducted by the Molesey Conservative Residents suggests there is a groundswell of support for the Walton Road car park to be made free to stop town centre users parking in residential streets. Following the lead article in the last Molesey News we invited householders to go to our website to tell us their views on ‘nuisance parking’ in side streets. Some 87% felt the Walton Road car park charges of 10p for half hour, 20p for an hour and a £2 all day were reasonable. But many expressed a view that a free car park would be the ‘only way’ to entice shoppers, shop workers and commuters, to use the Walton Road car park instead of clogging up residential streets. One view from Kings Chase was that there should be signage at Hampton Court Station asking commuters to use the car parks and “show more respect to residents”. An Arnison Road correspondent claimed free parking would not deter commuters from parking in side streets because they “wouldn’t be prepared to walk to Hampton Court Station from Walton Road”. Elmbridge has 28 car parks and only one is exempt from charges - the tiny 21 space Thamesmead car park in Walton. Molesey’s 128-space town centre car park generated a £16,011 loss in the last financial year due to its £48,000 ‘operating costs’, which include lighting and maintenance and enforcement, and business rates. However the council made a £950k profit from Elmbridge car parks as a whole. The survey asked whether people were in favour of residents parking permits as a way of de-clogging residential streets, such as School Road or Palace Road (pictured left). A resounding 80% said they did not want permits and would begrudge having to pay for them. Steve Bax of the Molesey Conservative Residents said: “My thanks to those who took part in the survey or who sent emails. It helps to build up a picture of the scale of the problem in Molesey and what people want - and do not want - to see done about it. Want to comment? Click on the headline of this article for the comments box.